Looking for a speaker for your next sales meeting? Need someone to inspire your group? 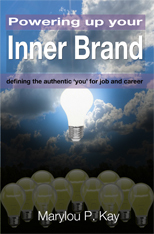 Marylou P. Kay, author of "Powering Up Your Inner Brand-Defining the Authentic 'You' for Job and Career" can take your group through an enlightening experience. Marylou is able to elaborate on how to build a personal brand, build rapport with clients or potential employers by bringing the best out in yourself. Taken from numerous articles and personal experiences, "Powering Up Your Inner Brand" is full of examples from the real world about people who have made themselves memorable in the minds and hearts of others. She will inspire you to take your experiences and build your own personal brand that reflects your true inner self. A must for those who want to develop themselves to their fullest potential and live the life you know is achievable. You and your group will come away inspired and ready to take the next steps to true, meaningful success in your field.